Not at all, but for the better in so many ways. My home circumstances changed my perspective on Jellybean, and then my arthritis made it almost impossible to hold a paintbrush so I couldn’t continue painting. Jellybean closed down and I opened Virtual Bird, a virtual assistance business. When running Jellybean, I’d always had a passion for the admin side of things and spent time doing admin for fellow small businesses so it made sense to transition to a business that I had skills in. I’ve learnt a lot, I’ve picked up lots of skills and undertaken an intense amount of training. I wish I’d known how good it was going to get. Well, I don’t know any business that hasn’t changed a bit in the time it’s been running – I for one started off thinking I was going to be proofreading student theses and dissertations forever, and had no inkling about the way I’d branch out into transcription and localisation. It seems that Anastasia was able to pick up on something she was doing well herself and already helping other people with and transition that into her new business – well done her! I’m glad it’s turned out so positive for her, and gives us a real lesson in being flexible and embracing change! Anastasia’s new website for Virtual Bird is at www.virtualbird.co.uk and you can also find her on Twitter and Facebook. Welcome to another Small Business Update – with Al Hunter from Mobile Remaps. I first featured Al back in January 2012 and then updated in 2013 and April 2014. He’s always been open and generous in sharing his business story and tips, and that’s not changed of course. Last year, when I asked him where he wanted to be in a year’s time, he replied, “As I said in last year’s review, I expect from the end of Q1 in 2014 to be a year of growth. And this is still my goal and expectation. Without going into too much detail on goal specifics, the aim for the end of Q1 in 2015 is to be in a situation where Mobile Remaps cannot serve all customers who would like our service. And, by this I mean that we are too busy to travel too far away to see our customers. This situation would lead to Mobile Remaps considering training an employee or franchising the business so that we can provide national coverage with local reach, which I think is the ultimate goal. But before we can do that, Mobile Remaps must first perfect as best it can both its local advertising strategy and service. For after all, the best national companies and franchises are just local business repeating themselves.” So how’s he doing? Hello again, Al, and welcome back for your fourth interview! Are you where you thought you’d be when you looked forward a year ago? No. 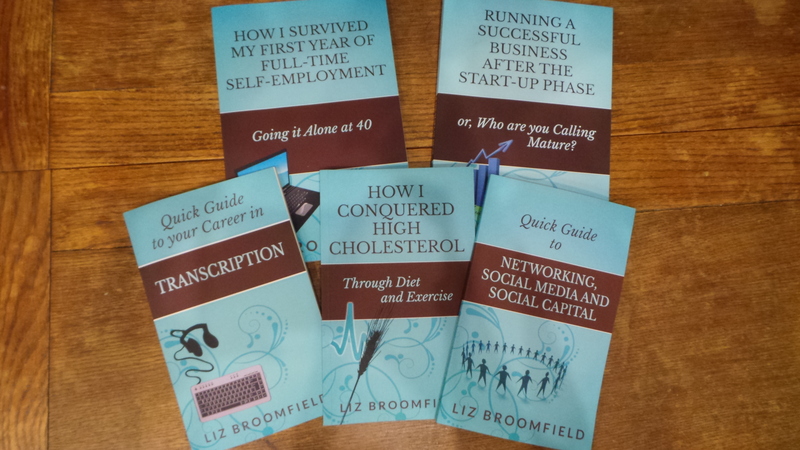 Whilst business has certainly improved, a prolonged marriage breakdown and divorce has meant that the mental or physical energy to put all my focus into growing the business as much as I wanted just hasn’t taken place. Having said that, we’ve improved on our Q1 goal of profitability and year on year growth has been in the 2-digit percentile month on month. Most of this is down to internet advertising and a growing reputation. In fact delivering on our customer service philosophy actually earned us a ‘Highly Commended In Town’ award from ‘The Best of Cambridge’, an award Mobile Remaps was delighted to received. Our marketing approach is entirely digital. And this has helped us no end. So, too, has working directly with garages. It means that when delivering our service to our customers, if we discover problems associated with a client’s vehicle, we can refer them to a trusted garage. This benefits all concerned, from the customer knowing they are going to a trusted garage, to the garage getting a new customer (with hopefully repeat business) and to us as well as it frees up time for Mobile Remaps to focus on its core business of engine remapping. You get more experienced with individuals as you go on. Unfortunately there are some individuals who try to deceive all involved with their vehicles. Now we’re more aware of such people we are much better able to protect ourselves as well as our customers. We updated our diagnostic equipment so that we’re able to get a much more clear picture of the health of the vehicle before we tune it. As such whenever we get individuals who say ‘my vehicle is running fine with no problems’ we’re able to prove before we even start tuning whether that statement is true and correct or not. A great example can be used from this very morning where we were asked to tune a Jaguar XF with a 3 litre diesel. The vehicle was ‘new’ to the customer but officially second hand. Our customer was unaware of the 13 separate faults his car’s computer was monitoring and that it had been in an accident previously but which the ECU had recorded. As a result of this we were able to write a diagnostic report for the customer and refer him to a trusted garage for further inspection before any engine tuning takes place. By following this diagnostic procedure before remapping customer vehicles, Mobile Remaps feels we’re better positioned to ensure our clients are fully informed about the potential for reliability issues with their vehicle before those issues become a huge inconvenience for them. It also enables them to resolve those issues earlier which allows them to save money on repair bills. From our point of view, it also allows Mobile Remaps to protect itself from accusations of ‘your remap caused this…’ when we know fully, that it didn’t. When it comes to tuning your vehicle, listen to the advice you are being given. One issue we constantly find is that customers are being given conflicting advice that leads to mistrust. Too many listen to forums or friends who have had similar issues with their vehicle and take the solutions for those other issues as being the right solution for their own situation. More often than not we find our customers are misinformed. When it comes to fault diagnosis with cars, the fault code is just the starting point. It is NOT the finishing point. Using another Jaguar XF we had in as an example, the vehicle showed a fault code relating to the Manifold Absolute Pressure (MAP) sensor. The garage pointed the finger at the remap, when we could see the fault code as being present long before any engine tuning took place. Although the MAP sensor is engine related, on these Jaguars they are part of the heating and ventilation control (air conditioning to you and me) system. The correct solution for this vehicle wasn’t engine tuning, or a new MAP sensor but to replace a 3 way valve stuck halfway under the dash! So in effect a small mechanical non electrical item (the valve) gave a fault code relating to something that wasn’t at fault. On a completely different vehicle however, I’m sure the MAP sensor could have been faulty which would have been a very simple and easy fix… but again that fix is not something engine tuning would correct or cause. So my professional advice to all is don’t be sold to by companies promising that engine tuning is the solution and don’t assume simple diagnosis by others means a simple solution. Paying for further investigation is cheaper than paying for the wrong solution in the first place! We’re happy with the direction Mobile Remaps is heading at this point in time. If double digit % month on month growth continues then for now that is what we’ll aim to continue achieving. But to do that we’ll need to refine our advertising, which is something we’re always looking at. And, we’ll need to partner up with more garages we can trust and refer business to (and vice versa). See, you get free car advice with Libro’s small business chats, too! I find the way Al’s refining his knowledge of the quirks of his market very interesting – and it’s a vital aspect to stay on top of as you go along. I’m sure this coming year will be a good one for him. Our website www.mobileremaps.co.uk has had a major revamp since last year, making it easier to navigate through. We also have a number of new local websites that are a big hit with our customers. These websites are www.remappingcambridge.co.uk, www.remappingpeterborough.co.uk, www.remappinghuntingdon.co.uk and www.remappingburystedmunds.co.uk. We are also developing a specific www.tuningboxes.co.uk website for customers further afield so we can put our remap software onto tuning boxes. This way, customers get the benefit of our engine software for their vehicles even if they’re too far away for us to remap directly. How do I accept one reviewer’s changes in Track Changes in Word 2010 and Word 2013? This article tells you how to view just one reviewer’s changes in Track Changes in Word (the screenshots are for Word 2010 and Word 2013 separately but this works for all version of Word, including Word 2003 and Word 2007). Once you can see the changes made by one editor or reviewer, you can delete the changes made by that one reviewer, leaving only the changes made by the other reviewers. Why would I want to accept only one reviewer’s changes in Track Changes? Recently, I worked on a document where I made all of my usual changes or comments, then the author responded and sent it back to me for re-checking. They hadn’t accepted my initial changes, but had told me in the email that they were OK. Because the document looked really messy and confusing, I wanted to accept all of my changes and just work with the author’s additions and amendments. Here’s how I did it. 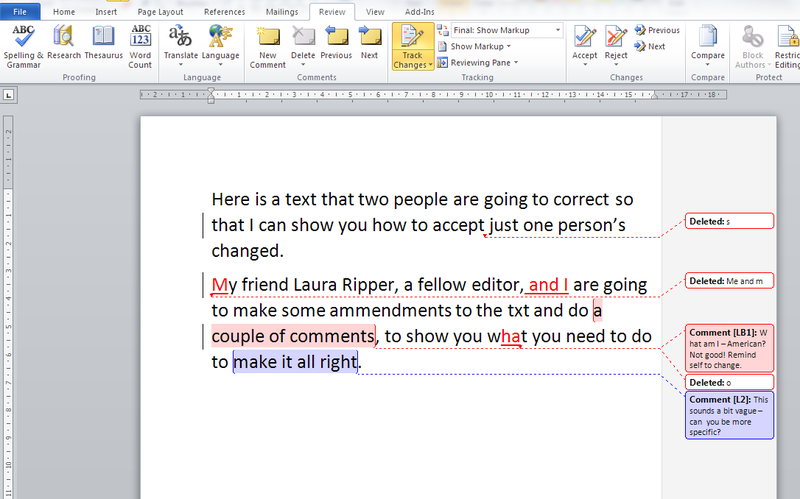 How do I see and accept one reviewer’s changes in Word 2007 and Word 2010? Here’s our text, with comments and corrections by two reviewers, shown in two colours. What I want to do is accept the changes made in blue and just end up with the ones in red to review. Once I’ve done that, I can only see the blue corrections. Note that the red comment box has also disappeared. We only see comments and corrections by Laura, but the ones made by LB will still be there behind the scenes. Now I want to accept these blue changes. In the Review tab, Track Changes, I click on the arrow at the bottom of the Accept button and click Accept All Changes Shown (it’s important to pick this one – if I chose Accept All Changes in Document, all of the changes, hidden and visible, would be accepted). Now all of the blue changes have been accepted and only the comment by L[aura] is visible. Now I can see the corrections in red and all of the comment boxes, and review them happily. 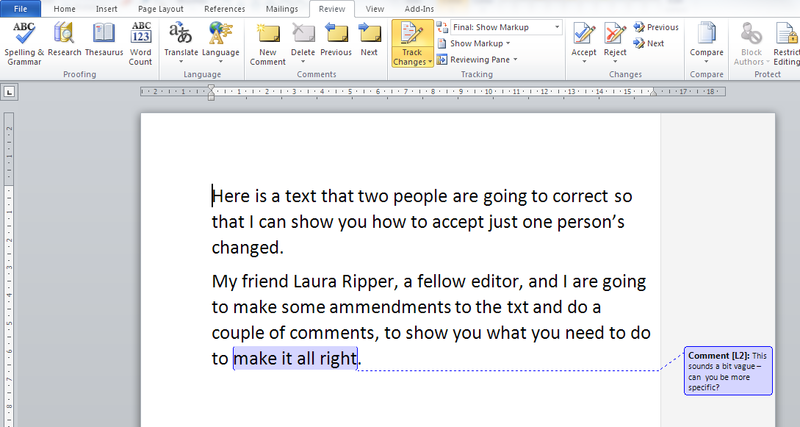 How do I see and accept one reviewer’s changes in Word 2013? Here is our text commented on and corrected by two people. 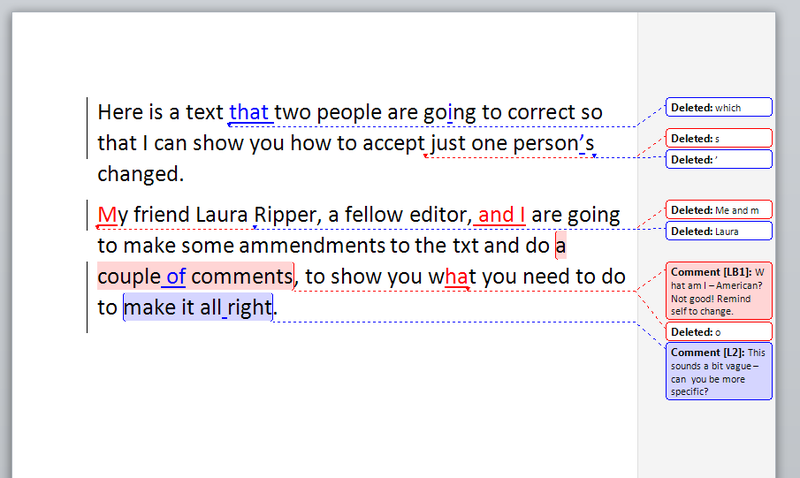 I want to view and accept the red changes made by Laura, then view my own ones in blue to review them (Yes, if you’re reading this all the way through, Word 2010 and Word 2013 chose the opposite colours for the two reviewers). First we need to view only the blue corrections in order to accept only those ones. In the Review tab, Track Changes area, click on Show Markup then Reviewers. This gives us the option to tick or untick by each individual reviewer. Here, I’m going to untick LB. Now we can just see Laura’s changes in red. Now we can see all of the changes suggested by LB as well as the comments by both people. This is another one written when I had a specific need and had to go hunting around, so I hope you’ve found it useful. If so, please share using the buttons below or pop a comment on! Formatting comments balloons – everything you have ever wanted to know! 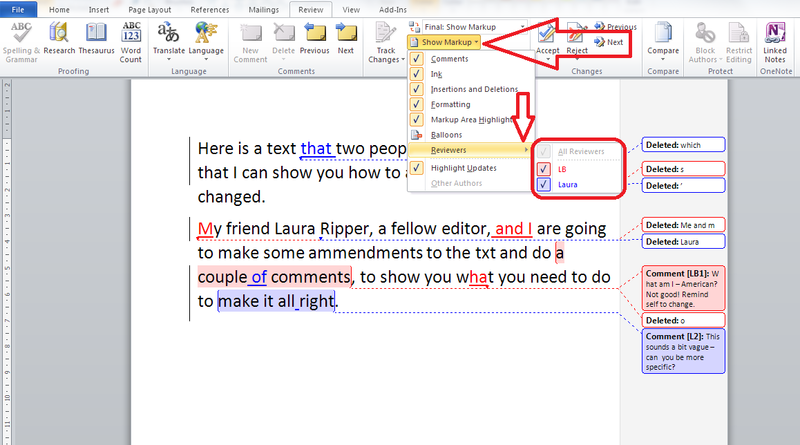 What to do if your comment boxes go tiny in Word – A common problem, hard to find the answer! Hello, Sarah, and welcome to the series! What’s your business called? When did you set it up? Hello! My business is called Banks’ Business Solutions and I started it in April 2014. I offer administrative support to small businesses, as well as support with certain software including MailChimp and developing WordPress websites. I returned to work following maternity leave in January 2014, and knew it wasn’t going to work out for me. I had a 5 year old at school and a 1 year old in nursery, and neither were happy or settled. One evening I was at a PTFA fashion show at school and got talking to another Mum who had her own business and was in need of some admin support but didn’t want the added expense of employing someone so she needed a freelancer. I came down with tonsillitis a few days later and spent a couple of days in bed Googling the possibilities of working from home/clients’ offices providing admin support. I discovered that there was a need for virtual support and moved forward from there. I guess my main motivator was my children, but I also wanted to find a way to support other women in business as I love to help people. I have always worked in administration, and this is something I know I am good at, so it made sense to start my business in an area where I could excel. I also had two clients lined up before I officially started as well! No, I have never run a business, however my Dad has been self-employed since I was 8, so I had an idea of what I would need to do. I took on my first client in May 2014 at the same time that I decided to hand my notice in at work (I only worked 3 days a week). Due to circumstances at work, I stayed on there until the end of September 2014 (I had planned to leave at the end of July). This ended up being a good thing, as it gave me chance to take on two further regular clients, meaning I had a steady income from the business before fully concentrating on it. I don’t intend to run the business full-time until my youngest daughter is at school, however for the last month I have increased my hours and will most likely be doing so going forward as I am getting busier. By staying on at work I was able to save some money to act as a buffer whilst things took off – however I haven’t yet had to use it all. That as a women you will regularly doubt yourself and your ability – the first time something went wrong I went into complete meltdown and was ready to pack everything in! Luckily I have a very grounded husband who picked me up. Anyone, man or woman, who starts their own business has to be able to get through the tough times, as there will be some and you don’t have a big company behind you if you do make a mistake. We are all human, though, and the world didn’t end because of my little mistake! Value yourself more – I worked out my initial hourly rate based on what I was earning in my job – I didn’t take the additional perks of the job into account and sold myself short initially. I am happy that I did things the way I did: any mistakes I have made I have learnt from, and they have helped me to grow both personally and professionally. There is no point looking back with regret. I’m glad I jumped in with both feet and started out. I could have spent months researching and might have a slightly more slick business when I started, but then I also wouldn’t be where I am. I am strong believer that everything happens for a reason and by starting out when I did, I was able to pick up the clients that I have. Keep your integrity – it is so easy to pretend to be someone you aren’t to close a deal, but I have always been honest and whilst that has meant not gaining some contracts, it has also meant I have gained others even over more skilled people. As I said above, I started out providing administrative support – I didn’t really even have a clear picture of what this meant! Since then I have learnt more and found things I really enjoy, like MailChimp and WordPress, so I have diversified and offer website development and email marketing setup via MailChimp now alongside my general admin support. I set out to work about 2-3 days a week, but am now working 3-4 most weeks, so I have definitely grown and I am really pleased with how the last year has gone. I hope to have one more regular client and be in a position to develop one website a month. I want to have enough work to fill 4 days a week and continue to make a steady income. Well, I think Sarah’s got a mature attitude and a stable and scalable business, good going in a business that’s only just coming up for a year old. I think she did things very sensibly, too – I started off while working in a day job and having that financial safety net has stood me in very good stead ever since. I’d be really interested to know whether any of my male readers think that the problem about doubting yourself and your ability is a specifically female thing, or affects certain business areas more than others. I certainly read about this as a female phenomenon, but maybe it’s more general than that. What do you think?